Explanation: This shadowy landscape of majestic mountains and icy plains stretches toward the horizon of a small, distant world. It was captured from a range of about 18,000 kilometres when New Horizons looked back toward Pluto, 15 minutes after the spacecraft's closest approach on July 14. The dramatic, low-angle, near-twilight scene follows rugged mountains still popularly known as Norgay Montes from foreground left, and Hillary Montes along the horizon, giving way to smooth Sputnik Planum at right. 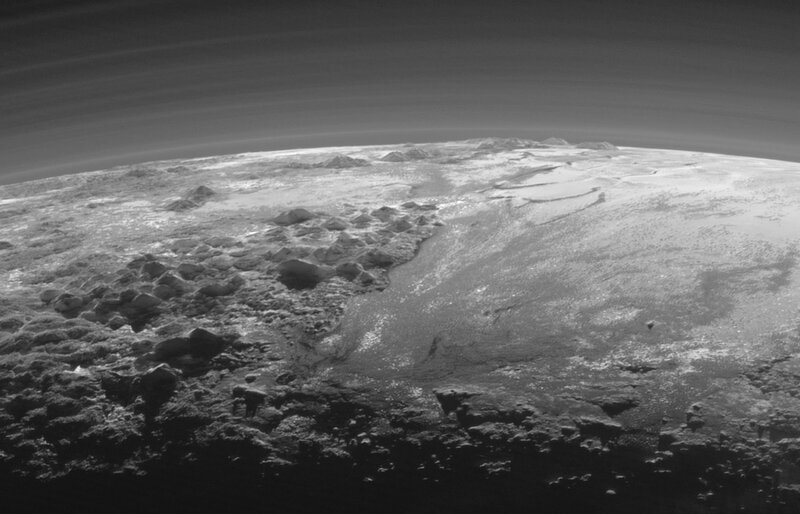 Layers of Pluto's tenuous atmosphere are also revealed in the backlit view. With a strangely familiar appearance, the frigid terrain likely includes ices of nitrogen and carbon monoxide with water-ice mountains rising up to 3,500 metres (11,000 feet). That's comparable in height to the majestic mountains of planet Earth. This Plutonian landscape is 380 kilometres (230 miles) across.